E X P A N D E D ! Comics from this chapter forward will be WIDER than ever, and I had to make a new header to accommodate! Also, reminder that you can access extra drawings, a fun and active discord chat, sketch requests, and even full-color commissions over at Patreon! I want to be able to share my most important creations with the world for free, but it’s also my dream to support myself doing the things I love eventually, so consider building up my confidence a bit and reaping some considerable rewards for yourself. AND if you just want to hang, I’m still streaming one of my favorite games (Super Paper Mario) on Monday/Tuesday nights. Come by for a story about a misfit group of villains who want to destroy the universe. It’s also got Mario characters in it too or something. I also stream many other things, including – increasingly – working on the comic! So you never know when you might get a sneak peek at the next pagie. Another great and comical comic page! Yes I can confirm that Courtney’s discord is pretty lit. She’s not paying me to say any of this. Yesterday: Ages ago. It checks out. These aren’t your dad’s comics, these are WIDESCREEN! Lord Skarva looks plain adorable in the last two panels. They are your grandpa’s comics though. this mostly makes me wonder about ecta/edna… yeah, we all know she is a buttkisser, hoverboss… but… why? she is a ghost, she can live forever in the afterlife, and she can go anywhere… so why does she work that hard for skarva…? WHY DOES SHE TRY SO HARD!? i get wanting recognition, but her exuberance is beyond normal… is it that she wants the curse to be lifted? that would make sense to search for the keys harder… but not in defeating blank… so her reason to work so hard has to be related not to the current situation, but the core of it all skarva… she seems to be on friendly terms with the 2nd… there are like… three pieces of this puzzle missing for me to see the grand image. We’ll explore more of her backstory someday! But I do want to say, before you get your hopes up, that there’s no secret reason or cause for the way she is. It’s basically just as Floyd analyzed her: she loves hierarchy. She likes authority, both having it (and trying to earn more) and serving those she deems worthy of being served. She has a genuine respect for her lords (and the Lady when she was still around) and her greatest frustration is that the people beneath her don’t give her the same respect. Basically, it’s truly just how she is. And dying didn’t change her. She could go anywhere and do anything, true, but that would remove her from the structure that she enjoys being a part of. She’s known the Second for all of his adult life and has seen his mental decline, so her relationship towards him now is a pity verging on tenderness. She appreciates the Third immensely for all he accomplished. But with our boy the Fourth, she sees something even more special; she finds his ambition contagious and wants to be a part of schemes that are grand enough to challenge fate. yay exposition! 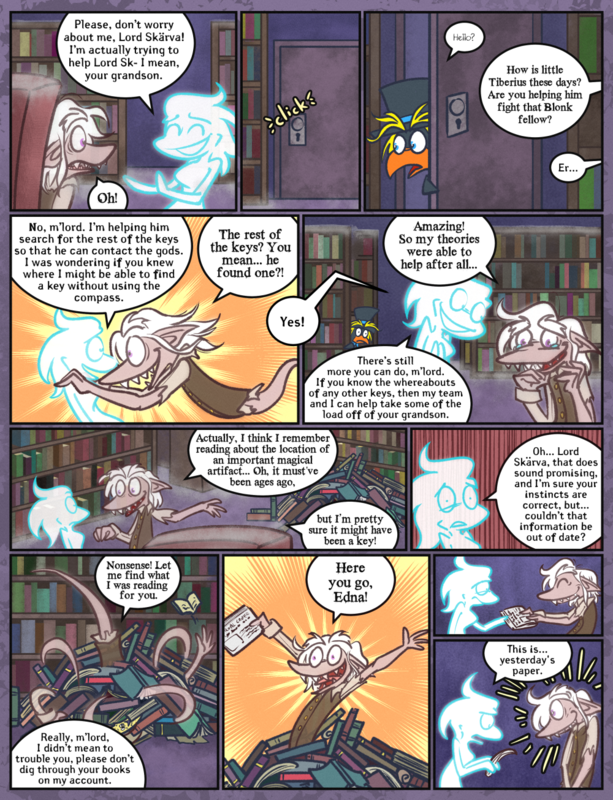 … are ghosts the best thing for backstory? i mean technically they have a past and then some. which for some reason makes me wonder how, and why, the cool, lazy, and always hawaiian shirt wearing fool we love… GOT A JOB WORKING FOR SKARVA. i mean i wonder why all of them decided to do so, but he doesn’t wanna work. so it makes less sense for him. our poor flish probably did not know better… well he’s happy so it’s fine. I’m really liking the interactions between the Second and Ecta. The Second doesn’t really leave that room, does he? You’d be surprised how easy it is to lose your regular sense of time if you’re ​in an area without any natural light for long enough. I was on an 18 hour flight once and the only thing that really gave a sense of time passing was that we would get meals every several hours. As a ghost, The Second doesn’t even have biological needs to remind him of time passing. Of course, his diminished mental health isn’t doing him any favors either. First i would love to say how much I appreciate the hard work and dedication you put into the comic how you wait to post the story until you get it right. With that being said, i hope its not to rude to ask if you comic updates are going to be on a regular schedule soon. Hey there! We still have Wednesday and Friday on the banner, because that’s the goal, and I’d love nothing more than to update twice a week and reliably. Telling our story and interacting with readers is still my favorite creative outlet. But at least for the moment, stress issues with me and Victor’s jobs (and my health problems) keep holding things up in either the writing or drawing process. Our goal right now is at least one update a week, though I can’t promise on what day. I would recommend that if you check back each Friday, you should be able to see at least one new update since the last Friday. If you’re looking for something I do reliably, there’s the stream mentioned in the description to this comic, which I do Monday, Tuesday, Friday and Saturday nights. It requires a lot less creative stamina and perfectionism than drawing, so I’m almost always able to live up to my commitments there. You might enjoy it! I appreciate that you recognize the care we put into the comic though. Both when it comes to the script and the art, we don’t want to put up anything we’re not proud of. The 3rd looks so BRIGHT, when he’s happy! Between character that you don’t normally see interacting. Like seeing Blank and Derk talk, and now Ecta and the 3rd, and I like that.